Agreement between Amir Abdur Rahman Khan, G. C. S. I., and Sir Henry Mortimer Durand, K. C. I. E., C. S. I. On 1993 Pakistan had to return Pukthonistan (NWFP) Back to Afghanistan,Ghaffar khan was the first pukthon who fought for his identity and now many pukthons are already awared because of waziristan and this agreement and like Baluch they are also waiting for right time,Pakistan itself is just Punjab and sindh. Sister can you give me the description and source of this map? Now keeping all these things we should not forget the US ARMED FORCE JOURNAL'S map. braat I got these stuf in my emails via a balochi_culture group. So many other people asked the same question to the author/compiler of the document. He provided the following link. I think it would be much helpful for you to understand the true situation. Afghanland.com - The British presented a signed document with the person of King Abdul Rahman Khan in 1893 referring to the borders between Afghanistan and British India. This document was in English and the person of Abdul Rahman Khan did not understand the English language, therefore leads the suspicious nature of forgery and or false documentation. The Dari or Pashto translation of this document or agreement has never been signed by Amir Abdul Rahman Khan, suggesting that he nullified this agreement. But the following researchers have provided arguments to the contrary that this document was signed and has expired. in either scenario, the Durand line does not exist today and the agreement was nullified the day it was written.. The argument between Afghanistan and Pakistan centers on the issue of Durand Line Agreement and its validity. But, the Government of Balochistan (GOB) in Exile challenges the “legality” of the Durand Line Agreement between Afghanistan and British India in 1893, not its “validity”. We believe that the Durand Line Agreement is an illegal agreement, and therefore, it is null and void. In 1839, the Afghan and British governments agreed to demark a 2,450-kilometer (1,519 miles) long border dividing British India and Afghanistan. The signatory of the document, known as The Durand Line Agreement, were His Highness, Amir Abdur Rahman Khan, ruler of Afghanistan, and Sir Henry Mortimer Durand, the foreign secretary of the British Indian government. Since British India ceased to exist in 1947 with the independence of India, Pakistan, and princely States, it was assumed that the Durand Line Agreement will be automatically upheld by the International Court of Justice as a binding agreement under uti possidetis juris, i.e, binding bilateral agreements with or between colonial powers are "passed down" to successor independent states. 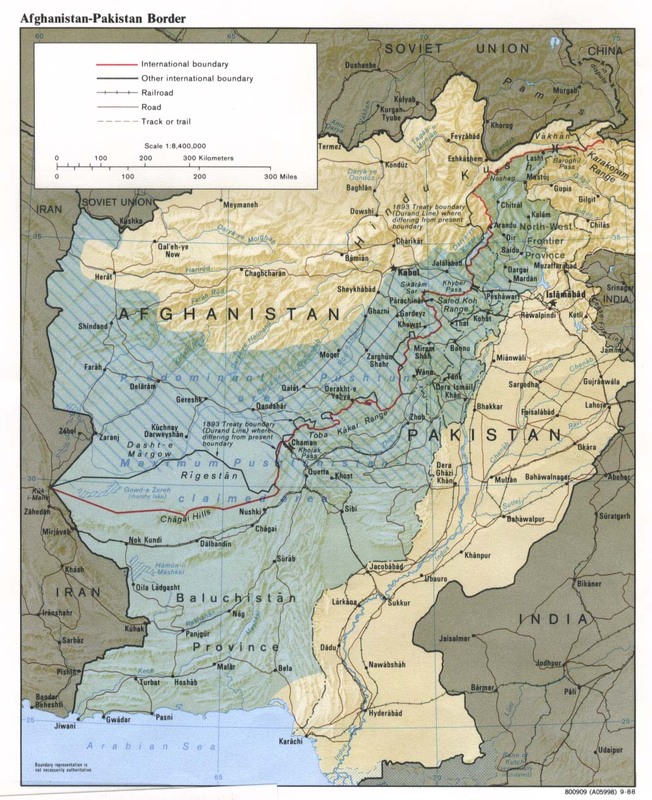 The Durand Line has been a source of contention between Afghanistan and Pakistan. On September 30, 1947, at the UN General Assembly meeting, Afghanistan even caste a vote against the admission of Pakistan to the United Nations. International Law states that boundary changes must be made among all concerned parties; and a unilateral declaration by one party has no effect. So, when in 1949, Afghanistan’s “Loya Jirga” (Grand Council) declared the Durand Line Agreement invalid, it was considered a unilateral declaration, and therefore, could not be enforced. Furthermore, Durand Line, like virtually any international boundaries, has no expiration date, nor is there any mention of such in the Durand Line Agreement, which is contrary to the popular beliefs of certain Afghan scholars that the Agreement lapsed in 1993 which is after a hundred years of its signing. To this date, the relations between Afghanistan and Pakistan are characterized by rivalry, suspicion and resentment. The primary cause of this hostility rests in the debate about the validity of the Durand Line Agreement. But, so far, it appears that Pakistan’s position in this debate is legally correct, and the Government in Afghanistan has never challenged Pakistan in the International Court of Justice. In 1839, when the British army advanced through Balochistan towards Afghanistan, they battled with the Baloch for the first time. During this conflict, 400 Baloch were killed along with Mehrab Khan (ruler of Balochistan), and the British took 2,000 Baloch prisoners of war. After recognizing Mehrab Khan’s young son, Nasir Khan II, as his successor, the Baloch and British signed their first treaty in 1841 that dealt with “Military Offensive and Defensive” matters. The British vacated Balochistan after the treaty was signed, and until 1854, there were no major diplomatic interactions between the Baloch and the British. On May 14th, 1854, a new Treaty was signed which annulled the 1841 Treaty. The new Treaty focused on “Alliance, Defensive and Offensive” matters. It also demanded the Baloch rulers to oppose all enemies of the British government; required British consent prior to any Baloch ruler could negotiate with any other state; and it permitted the British to station troops within selected parts of Balochistan. When the Baloch ruler broke certain provisions of the 1854 Treaty, diplomatic relations between Balochistan and British were discontinued in 1874. But, after two years, in 1876 the Treaty of 1854 was rectified with minor modifications allowing the British government to mediate any Baloch tribal disputes, and lease Quetta valley to establish a military cantonment. Although the Baloch ruler’s writ still ran over Balochistan, but now it was under the watchful eye of a British Indian government. From 1890 to 1891, to contain the Pashtun tribes of the Suleman Mountains from conducting border raids, the British carried out a series of military expeditions that resulted in the occupation of Zhob valley. Soon afterwards, they constructed a cantonment at Fort Sandeman along with extensions of a line of outposts. In 1893, serious differences arose between the ruler of Balochistan, Mir Khodadad Khan and the British. Soon after, on instigation of the British, Mir Mahmud Khan deposed his father and became the new ruler of Balochistan in November 1893. By July 1899, the Baloch administration had negotiated perpetual lease and transfer of management to British agency of the Nushki district and Niabat with all rights, jurisdiction and administrative power, in lieu of perpetual rent. This secured direct British control of the great highway connecting Quetta to Taftan. This arrangement prevailed till August 1947 when British India was dissolved. On August 11, 1947, the British acceded control of Balochistan to the ruler of Balochistan, His Highness Mir Ahmad Yar Khan - the Khan of Kalat. The Khan immediately declared the independence of Balochistan, and Mohammad Ali Jinnah signed the proclamation of Balochistan’s sovereignty under the Khan. The New York Times reported on August 12, 1947: “Under the agreement, Pakistan recognizes Kalat as an independent sovereign state with a status different from that of the Indian States. An announcement from New Delhi said that Kalat, Moslem State in Baluchistan, has reached an agreement with Pakistan for free flow of communications and commerce, and would negotiate for decisions on defense, external affairs and communications.” The next day, the NY Times even printed a map of the world showing Balochistan as a fully independent country. According to the Indian Independence Act 1947, all treaties and agreements between the British Government and the rulers of States were terminated as of August 15, 1947. On that day, the Khan addressed a large gathering in Kalat and formally declared the full independence of Balochistan, and proclaimed the 15th day of August a day of celebration. The Khan formed the lower and upper house of Kalat Assembly, and during the first meeting of the Lower House in early September 1947, the Assembly confirmed the independence of Balochistan. Jinnah tried to persuade the Khan to join Pakistan, but the Khan and both Houses of the Kalat Assembly refused. The Pakistani government took an aggressive stance against Balochistan, and in March 1948, the Pakistani armed forces started their operation against the Balochistan government. They invaded Balochistan on April 15th, 1948, and imprisoned all members of the Kalat Assembly. Throughout the period of British rule of India, the British never occupied Balochistan. There were treaties and lease agreements between the two sovereign states, but neither state invaded the other. Although the treaties signed between British India and Balochistan provided many concessions to the British, but none of the treaties permitted the British to demark the boundaries of Balochistan without the consent of the Baloch rulers. The Durand Line Agreement of 1893 divides boundaries between three sovereign countries, namely Afghanistan, Balochistan and British India. According to International Law, all affected parties are required to agree to any changes in demarking their common borders. In reality, the Durand Line Agreement was a trilateral agreement and it legally required the participation and signatures of all three countries. But, the Agreement was drawn as a bilateral agreement between Afghanistan and British India only, and it intentionally excluded Balochistan. Hence, under the rules of demarking boundaries of the International Law, the Agreement was in error, and thus, it was null and void as soon as it was signed. The British, under false pretenses, assured the Afghan rulers that Balochistan was part of British India, and therefore, they were not required to have the consent of anyone from Balochistan to agree on demarking borders. Meanwhile, the British kept the Baloch rulers in the dark about the Durand Line Agreement to avoid any complications. This policy helped the British to concentrate on fortifying their military positions in the region without causing any tensions between Afghanistan and Balochistan about demarking their boundary lines, otherwise this could have resulted in a war between Afghanistan and Balochistan. To ascertain that Balochistan and Afghanistan were not discussing the legality of the Durand Line Agreement among themselves, the British continued to reaffirm the Durand Line Agreement by each of the successive Afghan rulers who followed His Highness, Amir Abdur Rahman Khan. King Habibullah (1901-19), King Amanullah (1919-29), King Nadir Shah (1929-1933), and King Zahir Shah (1933-1973) reaffirmed the Agreement during their reign. The British ruled parts of Afghanistan without any legal authority, but through treacherous use of a piece of paper, the Durand Line Agreement, which did not have any legal standing in any court of law. As long as the British kept Afghanistan and Balochistan in the dark and apart from each other to discuss the Agreement, the British could continue to rule Afghan territory. But, in 1947, the British Indian government was dissolved, and hence, there was no reason for the British to continue this façade. But, Mohammad Ali Jinnah and his legal team immediately found out after Pakistan’s independence that the Durand Line Agreement was not a legally admissible/binding document. To continue the illegal occupation of territories belonging to Afghanistan, it was important for Pakistan to keep the flaw in the Agreement a secret. But, the dilemma was that Balochistan was an independent country, and one day the truth might be reveled to Afghanistan about the Agreement. This truth could result in Pakistan losing its Pashtun dominated areas to Afghanistan. It was very important for Pakistan to either annex or invade Balochistan to continue with their illegal occupation of Afghan territories. When Jinnah failed to convince the Baloch government to annex with Pakistan on basis of the two sovereign states being predominantly Muslim countries, he ordered his armed forces to invade Balochistan and, under duress, forced the His Highness, the Khan of Kalat to sign legal documents to merge Balochistan with Pakistan. This simple act of aggression against a sovereign nation assured Pakistan that their secret about the Durand Line Agreement would remain intact. Once Balochistan was secured, the Pakistanis deceptively used the law of uti possidetis juris to their advantage and continued occupation of territories belonging to Afghanistan. Pakistan is in illegal occupation of territories belonging to Afghanistan under false pretenses. To maintain its current territorial integrity, it is in Pakistan’s interest to have a weak and destabilized government in Afghanistan so there is no one to challenge the authenticity of the Durand Line Agreement. Therefore, Pakistani intelligence agencies have provided shelter for members of Al-Qaeda and Taleban who are committing acts of terrorism within Afghanistan to destabilize the democratically elected government of President Hamid Karzai. US armed forces in Afghanistan are eradicating remnants of terrorists from Taleban era. The Americans are also helping to rebuild Afghanistan and strengthen the democratic process of government to get a strong foothold in the country. But, Pakistan has waged a proxy war against the United States, and continues to terrorize the Afghan nation in hopes to frustrate the US to leave Afghanistan and weaken the Afghan government. Meanwhile, the Baloch have launched their “War of Independence” in Iran and Pakistan. Three tribal Sardars (chieftains) have united their forces and are engaged in a guerilla war against the well-equipped Pakistani armed forces. The Baloch freedom movement is gaining momentum, and people from all walks of like are joining in droves. Afghanistan and Balochistan should form a legal team to challenge the illegal occupation of Afghan territories and Balochistan by Pakistan in the International Court of Justice. Once the Durand Line Agreement is declared illegal, it will result in the return of Pakistan-occupied territories back to Afghanistan. Also, Balochistan will be declared a country that was forcibly invaded through use of force by the Pakistanis; and with international assistance, Balochistan can regain its independence. It is the right time to act now because the US and Allied forces in Afghanistan are positioned to facilitate the enforcement of the Court’s judgment. In 1948 Pakistan began the arrest, imprisonment and execution of prominent NWFP Pashtun leaders who did not want to be ruled by Pakistan. Also Pakistan does not have any educational, social and economic plans for the NWFP. Children of Pashtun are thought urdu in schools and businesses are forced to deal with Karachi so that Pashuns of the NWFP never reach powerful status.